Demonstrating that “cost recovery” should actually involve “a cost,” LA’s Recreation and Parks (RAP) Commission suspended the Community Garden plot fee rental increases after listening to a staff report that acknowledged that, in some cases, the City of LA didn’t even own or operate the gardens being subjected to the fees. At issue is a Recreation and Parks “cost recovery” plot rental fee that was approved in July of 2010 by the RAP Commission as part of a 70+ page document that flew past the radar of LA’s gardeners until November when RAP staff announced the fee increase at a gardener’s meeting. The compost hit the fan! LA’s loose network of community gardens includes the Wattles Farm, operating in sync with RAP since 1975, the Ocean View Farms that was issued a permit in 1977, and the Orcutt Ranch which has been around for 25 years. Some gardens, such as the Sepulveda Garden Center with over 800 plots, are quite large while others, such as the Rose Hills/Debs Gardens with 21 plots, are more intimate. Some gardens, such as the Expo Center/CSU Urban Garden, are operated as educational facilities while others, such as Little Green Acres Park, are closed to the public and actually operated by RAP staff and grow food as a service for the community. While RAP’s proposed fees came under the guise of “cost recovery” the RAP staff report revealed that the proposed charges were being applied to gardens that have no costs to the City of Los Angeles. The gardeners at Ocean View Farms operate 500 plots on DWP land and already pay their own water, requiring no services from RAP. Of the other gardens, one of them is located on Caltrans property and another is located on land belonging to the Army Corps of Engineers. Most interesting was the survey of the services actually provided by the City of LA to the gardens. In some cases, RAP staff are reported as providing “edging, pruning, and blowing” services, a claim that was challenged as being at odds with the ethos of a community gardening. At the end of the report, it became apparent that the RAP proposed/Commission approved/Gardener protested fees were inappropriate when examined on a case by case basis and even simply charging for water became complicated with plot sizes that vary from small as 32 square feet at North Weddington to a maximum of 1500 square feet at Little Green Acres. RAP staff recommended a suspension of the previously adopted fee increases while the Los Angeles Neighborhood Council Coalition (LANCC) and the East Hollywood Neighborhood Council (EHNC) both called for the fee increase to be rescinded. 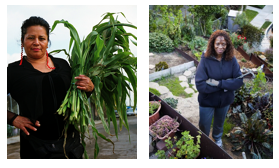 While the immediate discussion of community gardens may seem to only impact the 1500 gardeners who operate plots in LA, the larger issue is one of simple municipal operations and LA’s bureaucratic confusion over core services, cost recovery, and administrative authority. It is imperative that this simple “cost recovery” issue be examined in the big picture and that the City of LA stop looking to balance the budget on the backs of the individuals it serves but instead focus on core services, operating efficiencies and an honest accounting of assets and liabilities.